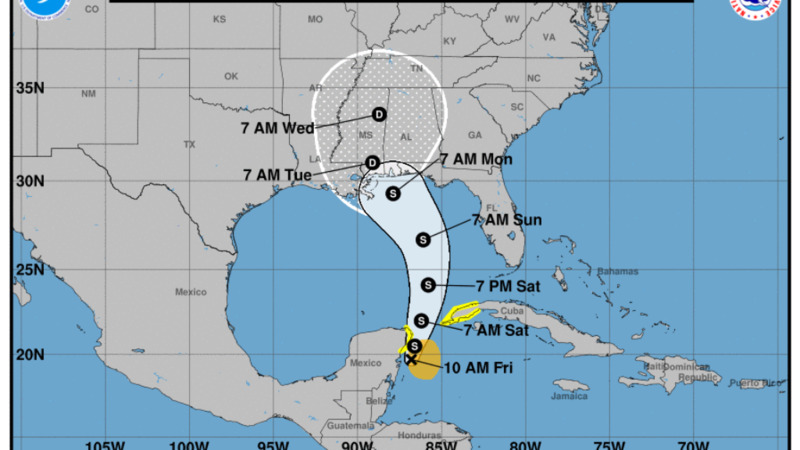 The first tropical storm of the season, Alberto, has formed near Cuba and Mexico and appears to be heading for Florida. 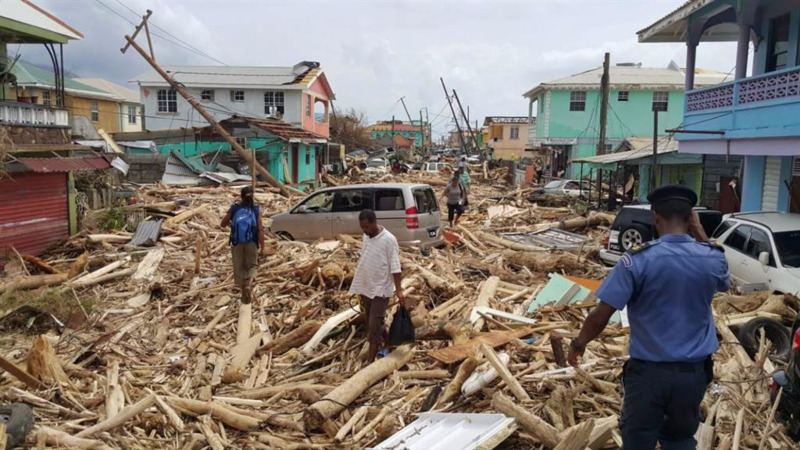 According to an update from the US National Hurricane Center (NHC), the sub-tropical storm was located about 55 miles (90km) south of Cosumel, Mexico and about 195 miles (315km) southwest of the western tip of Cuba. 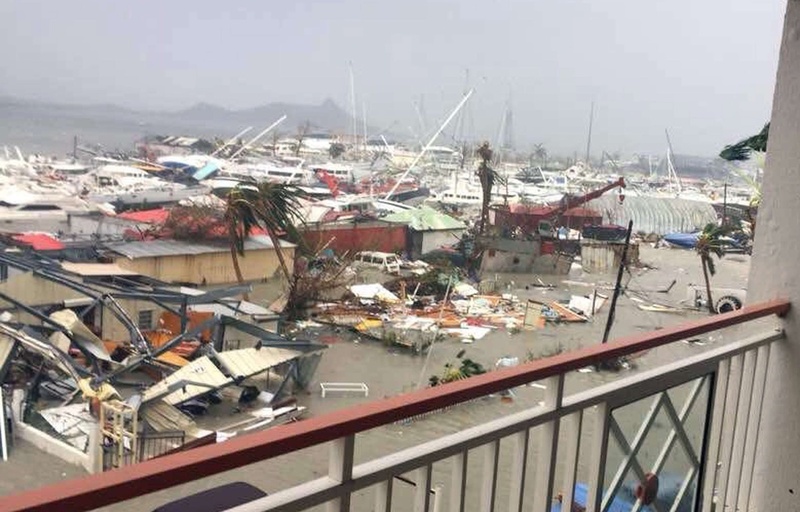 At 10:00 am Friday the storm had maximum sustained winds of 40 miles per hour (65 km/hr) and was travelling north-north-east at six miles per hour. The storm has a minimum central pressure of 1005mb. 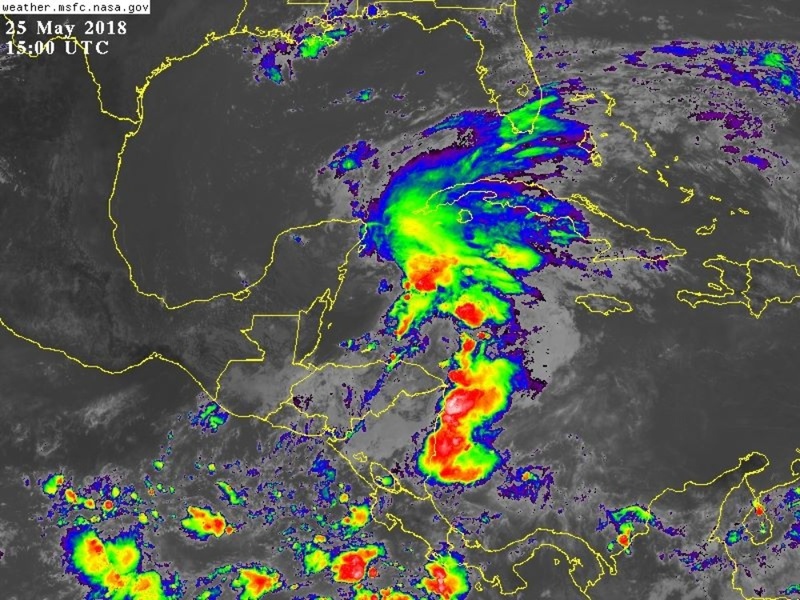 Heavy rainfall is expected to affect the Yucatan Peninsula, as well as western Cuba, Florida and the northeastern Gulf Coast over the weekend. The Government of Mexico has issued a Tropical Storm Watch for the east coast of the Yucatan Peninsula from Tulum to Cabo Catoche. The Government of Cuba has issued a Tropical Storm Watch for the western Cuban province of Pinar del Rio. At 1000 AM CDT (1500 UTC), the center of Subtropical Storm Alberto was located near latitude 19.7 North, longitude 86.8 West. The storm is moving toward the north-northeast near 6 mph (9 km/h). A general slow motion toward the north is expected through the weekend, followed by a northwest turn by Monday. 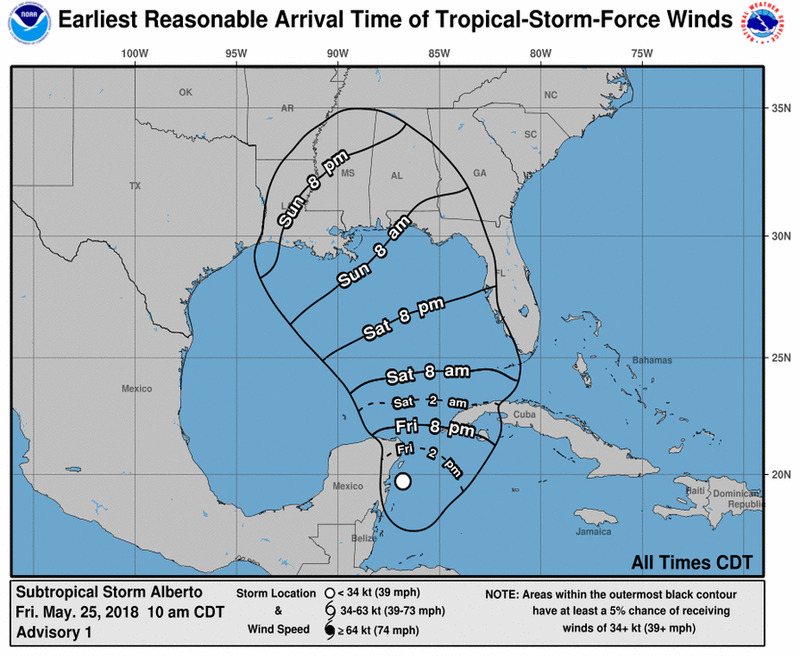 On the foreast track, Alberto is expected to pass near the eastern coast of the Yucatan peninsula on Friday, be near the western tip of Cuba Saturday morning, emerge over the southeastern Gulf of Mexico by Saturday night, and approach the north-central Gulf Coast on Monday. These rains could produce life-threatening flash floods and mudslides. Rainfall accmumulations of 4 to 8 inches with maximum amounts of 12 inches are possible across the Florida Keys and southern and southwestern Florida. Heavy rain will likely begin to affect the central Gulf Coast region and the southeastern Untied States later this weekend and continue into early next week. Flooding potential will increase across this region early next week as Alberto is forecast to slow down after it moves inland. The next advisory will be issued at 4:00 pm Friday.